Many millions of people are affected by the trauma of war. Psychologists have a good understanding of how experiences of war impact on memory, but the significance of external environmental influences is often disregarded. 'Memory, War and Trauma' focuses on our understanding of the psychosocial impact of war in its broadest sense. Nigel C. Hunt argues that, in order to understand war trauma, it is critical to develop an understanding not only of the individual perspective but also of how societal and cultural factors impact on the outcome of an individual’s experience. This is a compelling book which helps to demonstrate why some people suffer from post-traumatic stress while other people don’t, and how narrative understanding is important to the healing process. Its multidisciplinary perspective will enable a deeper understanding of both individual traumatic stress and the structures of memory. "An imaginative and highly readable introduction to the study of the lifelong personal consequences of war. The author demonstrates a lively personal engagement with his subject and has the necessary wide range of interests, from the biological and social sciences to the humanities, to do it justice." 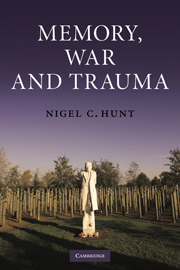 "Nigel Hunt’s Memory, War and Trauma is a must-read for military and other psychologists and mental health workers together with many others, including historians, social scientists and writers, who may have an interest in the topic. The book provides a very readable overview of the area with a particular focus on the roles of personal narrative and social discourse and on the perspective shown from literature." "....provides a useful practical tum, in exploring the ways individuals who have suffered from traumatic stress use the experience to promote personality growth and self-awareness.... explores the challenges of working with traumatized individuals as they age, and the ways that the aging process can affect prior coping mechanisms. This is an important interdisciplinary work on trauma that is both clinically rigorous and humanistically sharp. It is a valuable addition to the growing trauma studies literature.... Highly recommended...."
"....Memory, War and Trauma provides an interesting thesis for consideration by researchers and clinicians.... Hunt clearly develops the text in order to provide a resource to help victims of war trauma grow and to better place their experiences in light of their life narrative in the society and times in which they live. Instructors, researchers, and therapists should find this text of interest." "....Hunt's book, Memory, War and Trauma highlights the limitations of current empirical approaches to studying war trauma and presents a narrative methodology that he argues will better capture the unique individual experience of trauma.... this book will be a benefit to psychologists who study and treat individuals touched by war because it will encourage them to think beyond traditional approaches to research and treatment."